The Dutch are a deeply patriotic bunch. Here are three things to watch out for. You cannot avoid the colour orange. On Queen’s Day, during football matches, at the ice rink – it is everywhere. Oranje is the nickname given to Dutch national sports teams thanks to their – often – orange kit. The nickname comes from the Dutch royal family, the House of Orange, founded when Willem I, the first Dutch king, inherited the title from the French noble family. The colour has now become a symbol of Dutch pride – and don’t the rest of us know it. The Dutch national anthem, the Wilhelmus, is said to be the oldest national anthem in the world. Written from the perspective of William of Orange (not a king but a stadhouder), it dates from the 16th century but only officially became the Dutch anthem in 1932. The opening stanza appears to refer to William as being of German blood, but this is disputed by some experts. William of Orange also rather strangely sings of his allegiance to the Spanish king. 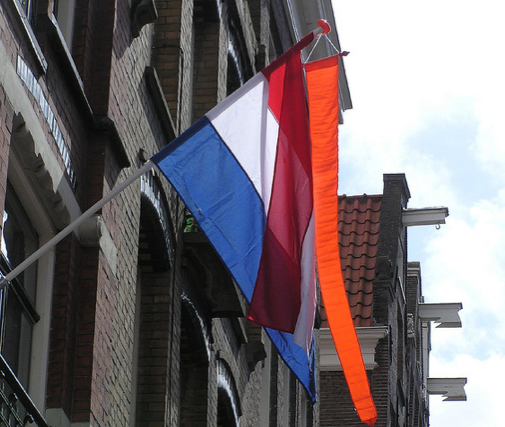 As well as public buildings, many Dutch private homes have their own flagpole and fly the flag on ceremonial days. Strict protocol applies. The rules for public buildings are divided into ‘limited flag days’, such as royal birthdays, and ‘extended flag days’, like Liberation Day (May 5), when all public buildings fly the flag. On royal birthdays the custom is to fly the red, white and blue national flag alongside an orange pennant representing the House of Orange. Be sure to take them down before it gets dark or you will be breaking the rules. Note: Rucksacks or other bags hung outside houses on flagpoles in May and June indicate that someone in the house has successfully passed their school leaving exams. Sorry, but the Dutch only are a deeply patriottic bunch if it concerns football. In no other case Dutch people are patriotic or nationalistic. If they are then they are either in the army (and therefore politically right winged) or they are very right winged bartigers who want every non-western foreigner to leave the country forgood. Actually the fast majority of Dutch people are very globalistic and are real “wereldburgers” (world citizens) except when it comes, as said, to football.